This week we are requested to write part of the IEEE Huggy Pajama paper. Here is the content I included for the methodology of the different technology. Currently there are different kinds of fabric display technologies available, naming Electro Luminescent fabric displays, thermochromic fabric displays, photochromic fabric displays, LEDs displays, etc. They can be categorized into two major channels, i.e. emissive displays and non-emissive displays. Electroluminescent substances give off light after being exposed to electricity. They are a kind of phosphor, which emits light after absorbing electricity.Designers usually use electroluminescent wire (EL wire) to create effects on textiles. EL wires consist of a few layers. The core layer is a copper wire that acts as a conductor in the EL wire's alternating current (AC) power system. On top of the copper is a coating of electroluminescent phosphor. This is the material that will emit light after encountering an AC electric field. The next layer consists of two wires wrapped around the phosphor. These wires complete the second half of a circuit, the first half consisting of the copper conductor. Lastly, there is a pair of plastic sheaths protecting both the phosphor material (moisture can ruin some phosphors) and the user from electric shocks. 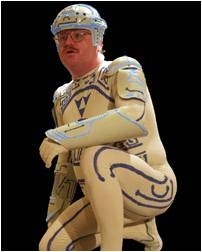 Jay Maynard -- the Tron guy -- constructed his costume with EL wire. Electro Luminescent panels are paper-thin laminated panels that illuminate as an electrical current is passed through the panel. Phosphor crystals with coloured overlays are sandwiched between conductors, and as an electrical current is applied, the phosphor crystals rapidly charge and emit light which illuminates the printed overlay. They consists of several layers as shown below. 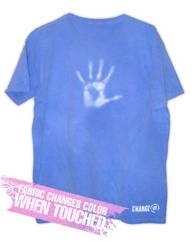 An example of such display technology is the EL T-shirts which changes its pattern in the front of the shirt. 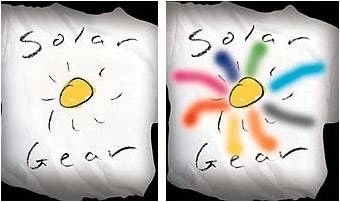 By hiding a battery at the bottom inner side of the T-shirt, the pattern is allowed to change when electricity passes through the EL wires embedded in the clothes. Another technology which can be used for emissive display is to use embedded luminescent LEDs. 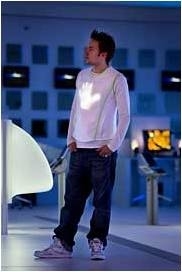 One successful example of using such technology is the Lumative Shirts from Royal Phillips Electronics. Flexible arrays of LEDs are fully embedded into the fabric without compromising the softness or flexibility of the cloth. They were mounted on a flexible lightweight plastic substrate, with each pixel containing closely spaced red, green and blue (RGB) LEDs. Electrically conducting tracks on the substrate connect these pixels into a matrix display configuration, allowing each pixel to be individually addressed and the light intensity of its three LEDs varied in order to produce any desired color. There are several types of technologies available. They involve the change of colour under different external influences. The main types of color-changing inks in the market are thermochromic inks, which change its colour in response to temperature fluctuations, and photochromic inks, which work under the influence of UV lights. Also, there are other types of methods available, for example, piezochromism which works by applying pressure to the materials. However, such technology needs more complex mechanism which does not fulfil the project requirements. There are two basic approaches for this method, naming liquid crystals and leuco dyes. Liquid crystals are used in precision applications, as their responses can be engineered to accurate temperatures, but their color range is limited by their principle of operation. Leuco dyes allow wider range of colors to be used, but their response temperatures are more difficult to set with accuracy. Some liquid crystals are capable of displaying different colors at different temperatures. These dyes rely on liquid crystals contained in microencapsules. The liquid crystals are cholestric, also known as chiral nematics, which means that its molecules arrange themselves in a very specific helical structure. These structures reflect certain wavelengths of light. As the liquid crystals heat up, the orientation of the helices changes, which causes the helices to reflect a different wavelength of light. To our eyes, the result is a change in color. As the crystals cool down, they reorient themselves into their initial arrangements and the original color returns. Leuco dyes are chemicals displaying a color change (usually between the colorless leuco form and the colored form) in dependence on temperature. The dyes are rarely applied on materials directly; they are usually in the form of microcapsules with the mixture sealed inside. An illustrative example is theHypercolor fashion, where microcapsules with crystal violet lactone, weak acid, and a dissociable salt dissolved in dodecanel are applied to the fabric; when the solvent is solid, the dye exists in its lactone leuco form, while when the solvent melts, the salt dissociates, the pH inside the microcapsule lowers, the dye becomes protonated, its lactone ring opens, and its absorption spectrum shifts drastically, therefore it becomes deeply violet. Photochromism is a reversible change of color upon exposure to light. It undergoes a reversible photochemical reaction where an absorption band in the visible part of the electromagnetic spectrum changes dramatically in strength or wavelength. In many cases, an absorbance band is present in only one form. The degree of change required for a photochemical reaction to be dubbed "photochromic" is that which appears dramatic by eye, but in essence there is no dividing line between photochromic reactions and other photochemistry. The thermochromic ink ordered has arrived. While my project partners try to overlay the ink onto the fabric, I started to pay attention to the temperature controller circuit that the previous FYP student have been working on. He uses a different PIC controller for the circuit, PIC16F2620 which is very small in size and could be a good choice for the circuit design. - As our topic is limited to non-emissive colour changing materials which can be displayed on fabrics, the only choice of ink we can use is the thermochromic ink. - Other FYP student has already been working on the temperature controller circuit for the entire year, and what we can do now is to wait for his work and try to perfect it and look for new methods.